Crazy Rich Asians, out now, directed by John M. Chu and based on the novel by Kevin Kwan, stars Fresh Off the Boat's tremendous Constance Wu as NYU economics professor Rachel Chu and the delightfully charismatic Henry Golding as her dashing boyfriend, Nick Young, who is the secret (at least to Rachel) heir to his family's Singapore luxury real estate fortune. Nick invites Rachel to Singapore for his best friend Colin's wedding, and Rachel discovers that her handsome boyfriend is in fact a household name in his native country. The movie is more than just your typical rom-com fare. It's the first major Hollywood-produced film featuring an entirely Asian and Asian-American cast since The Joy Luck Club, which debuted 25 years ago. The movie itself is a gorgeous tableau of Singapore and a comedic romp with the young men and women in Nick's family who live extremely opulent lifestyles. The cast is tremendous, even actors with supporting roles, who simply sparkle when they're onscreen, such as glorious queen Awkwafina and funny man Jimmy O. Yang. Wu channels her inner badass and holds her own in scenes with the commanding Michelle Yeoh, who plays Young's mom, the disapproving matriarch who tells Chu that she'll never be good enough for her son. 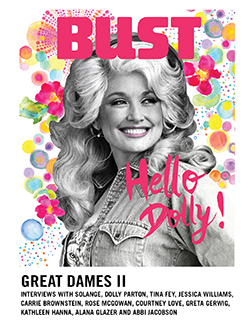 Read BUST's cover story with Constance Wu here! Jennifer Chen is a Los Angeles-based freelance journalist who writes for Bust, O: The Oprah Magazine, Real Simple, Good Housekeeping, and Brit + Co. Jennifer is raising twin feminists with her TV writer husband and her adopted pug Chewbacca Tofu, and she documents her vegan eating adventures on Instagram @jchenwriter. Follow her at jchenwriter.com and on Twitter @jchenwriter.